There is a certain raw beauty to be found most days at the James River Retreat but some of the most spectacular sights can only be experienced after dark. The yellow reflection of a pair of eyes peering at you through the trees, the Milky Way spilling across an inky black sky and, every now and then, a magical display of the Northern Lights. Of course, it’s not magic at all that creates these light displays on our horizon. The Aurora Borealis – known in Canada as the Northern Lights – occurs when solar winds are pulled into our atmosphere by earth’s magnetic force. These winds create collisions between charged particles and atmospheric gases, the colours varying with the gases and the altitude at which the winds occur. The palest of greens – more like white with a subtle tinge of greenish light – is the most common colour you’ll see with the naked eye at the Retreat and is caused when particles collide with oxygen at lower altitudes; a hint of pink at the lower edge means flashes of nitrogen. Reds means the winds are occurring at a higher altitude. Blues and purples come from hydrogen and helium but they’re difficult to see at night with the naked eye. That’s the basic science of auroras, now back to the awe of viewing them on a cold winter’s night. 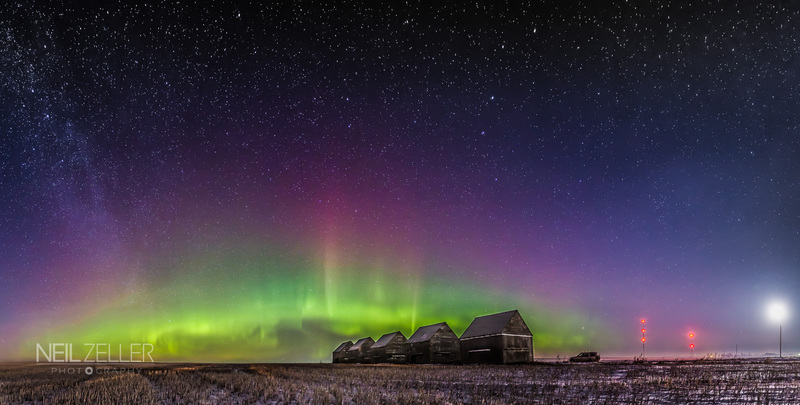 Actually, it doesn’t have to be cold or even winter for auroras to occur but cold and clear often go hand-in-hand and dark skies make for the best viewing. Step outside any clear night from now until mid-April and there’s a chance you’ll see the Northern Lights. If you want to improve your chances a little more, try the University of Alberta’s AuroraWatch website or even subscribe to their free alert service for the best odds. Auroras may be seen anytime after dark but peak hours are from 11pm-2am. I’ll often see a subtle glow on the northern horizon by about 10pm. This tells me I should keep checking over the next hour or two to see if anything develops before I turn in for the night. That said, auroras can start with little warning. One memorable Christmas Eve, we had the telescope set up to view the rings of Saturn. When we eventually returned to the cabin to warm up, I glanced over my shoulder one last time only to catch perhaps the most breathtaking display we’ve ever seen at James River. Is it possible to capture auroras with a digital point and shoot camera or will I need something more sophisticated? To capture the aurora you will need a camera that has the ability to set the ISO, Aperture (F stop) and shutter speeds manually. Most cameras have these capabilities. Certainly digital SLR cameras are ideal with their larger sensors and simple adjustments , but many point and shoot or mirrorless systems can be manually adjusted. Take a look at your camera’s manual under ISO, Aperture and Shutter speed adjustements. Do I need any special equipment beyond my camera? A tripod is vitally important. Because you are exposing your images for longer than 1/60 of a second, there is no way you can hold still to create a sharp image. You can rest your camera on something solid as well, but it’s still easiest to use a sturdy tripod. A remote cable, switch or the ability to use your camera’s delay function is needed. This allows you to be ‘hands off’ when shooting the night sky and avoid any unnecessary camera shake via pushing the button. The 2 second timer will work as well. What length of exposure will I need to capture an aurora with my camera? This depends on the intensity of the auroras. Modern cameras have the ability to see things the human eye can’t. A 5 second exposure with a mid level DSLR (a canon rebel t4i for example) camera will produce incredible results and a 30 second exposure of a seemingly black night will show clouds, stars and other things that are invisible in to your eye. A typical starting point for me when shooting the skies north of Calgary would be ISO 1000, F2.8 at 30 seconds. This allows me to ‘see’ on the back of my camera what is actually out there in the sky. If my exposure is too bright, I would adjust my shutter to 15 seconds and shoot again. If you find the image noisy or grainy, you can adjust your ISO (your camera sensors sensitivity to light) down to 800 or 400. With my pro level camera, I can shoot relatively noise free up to ISO 3200 and shorten my shutter times down to a second or two to capture very fast moving aurora. Are there any other settings I’ll need to play with besides exposure? If you leave your Aperture ‘wide open’, that is, on the lowest number, you are allowing the most light in. It is like the iris of your eye and you have a better chance of seeing in the dark when this is as open as possible. Some lenses start at 1.2, but most are 2.8 to 4.0 as a starting point. ISO is the sensitivity to light. The higher the number, the more sensitive. But be warned if you get too high, you will introduce artifacts or ‘noise’ to your image. Some is ok if that’s what it takes to get a good image of the aurora, but too much will ruin your photo. Thanks, Neil, for sharing your photos and tips. If these photography tips have got your shutter vibrating with excitement, you’ll want to check out Neil’s Yukon Aurora Workshops departing February and March 2015 for aurora viewpoints even further north than ours. We hope this article inspires you to take a moment on your next visit to the Retreat to bundle up, step outside after dark and look to the north for a sign. But first-timers, know this: what starts as a subtle glow on the horizon can build into ripples, spikes and swirling bands that fill the sky and keep you rooted to that spot well into the night, not wanting to look away, even for a second. This entry was tagged aurora, aurora borealis, james river retreat, night sky, northern lights, photography, sky, website. Bookmark the permalink. I would also recommend a camera that you can manual focus. Many cameras have issues autofocusing in low light conditions and can’t focus on the northern lights. If you are just photographing the lights (no real foreground element), set the focus to infinity and leave it there. If you have a foreground, use a flashlight to light it up and focus on that. Then turn the flashlight off and leave the manual focus there.